The BBM for Android app has officially launched today, with BlackBerry confirming earlier the messaging service will hit the Google Play Store at midday(GMT). “BBM for Android will be available at 12 pm on Saturday 21,” an official statement from the company confirmed in the run up to the launch. The BBM Android app will be available as a free download and allow users to chat for free with follow BBM users across all platforms. The first time BBM will have been made available to none BlackBerry handset users, the BBM Android app will precede the BBM iOS app by a matter of hours, with the iPhone bound iteration to be rolled out just after midnight. A launch that is likely to be clouded by other goings on at the company, the BBM Android app release comes in the wake of a fresh round of losses and job cuts at the Canadian based BlackBerry. Having reported anticipated Q2 losses of almost $1 billion, BlackBerry has confirmed that it is to cut 4,500 jobs globally, an announcement which has seen a 17 per cent drop in its share prices, in a single. Despite the hard times the Canadian company is currently in, opinions in several quarters have lauded its initiative at offering BBM on other platforms, noting that chat applications like Whatsapp were already phasing BBM out. It’s emergence on the now reigning android OS, they say, would mean Blackberry does not lose out totally on its customers, and yet still have a fair share of those who wouldn’t use a Blackberry smartphone on a good day but would use the BBM since it’s available at no extra cost. 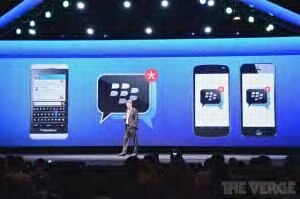 BBM can be downloaded from September 21 and September 22 for Android smartphones and iPhones, respectively.